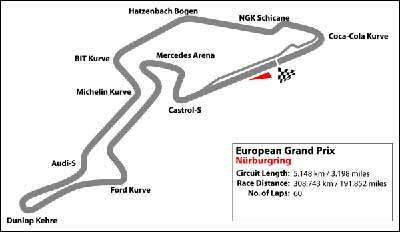 The (new) Nurburgring is in use this weekend for the European Grand Prix. Up in the mountains, it is close to Michael and Ralf Schumacher’s home town of Kerpen, so I am sure both of them have done many laps of the famous “old” Nurburgring. Unfortunately, the days of the old circuit through the forest have gone, as far as F1 is concerned. Following claims from the drivers that it was too dangerous, this new 2.882 mile circuit, with little character, was constructed in 1984, close to the original track. It is of interest to note that the first thing that the new generation of F1 drivers do on arrival at the circuit, is to shell out a few Deutschmarks to drive the famous old circuit, the Nordschleife! Nobody could ever claim to be the absolute master of the Nordschleife, which is still used for Touring Car categories. Any driver who has driven on the old circuit speak in terms of awe of what is possibly the most demanding circuit ever constructed. I have driven it! Totally mind blowing! A circuit that keeps you on your toes for the entire lap. The laconic Aussie Frank Gardner, with a total disregard for political correctness, claimed it was designed by Adolf Hitler for Jewish drivers! I will be watching from my perch at Jamieson’s Irish Pub Soi AR, in front of the big screen. Join me for a meal before the action starts at (I think) 7 p.m.
What did we learn from Imola? Well, M Schumacher and Ferrari were back on the top step of the podium, and there is much talk that “Ferrari is back!” Personally, I do not think so (yet). Alonso was obviously much quicker than Schumacher, but Imola is another impossible to pass circuit (like Monaco and Hungaroring) and honestly I believe should be dropped from the calendar. (I know Senna died there, but that’s not a good enough reason to keep it.) There was a little interest to see if Alonso could pass Schumacher in the final 20 laps, but unless Michael made a mistake, there was no way he could get past. At one stage they were lapping three seconds slower than they had been, and that’s forever in F1 terms. 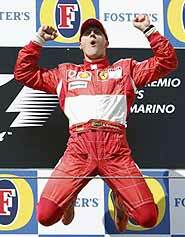 Schumacher made no mistakes and so deserved his top step on the podium. However, if it is mistakes you want, Honda and Jenson Button are holding the full hand at this stage. After a very poor showing in Australia, despite his qualifying effort, Button and crew topped this off with a mistake by the lollypop man, which saw Button taking off down pit lane, still attached to the refueling rig, while his crew members did cartwheels down the bitumen! If you want an exciting job in F1, lollypop for Honda could give you that thrill, but ask for danger money. Honda’s “equal first” driver Rooby Baby Barichello made sure he got the number 2 hat again. In the F1 paddock, it must be “Beware the Ides of March!” And April and May. The (not so very) Super Aguri team’s second driver Yuji Ide is not only inexperienced and too slow, he is also dangerous, tipping Cristijan Albers into a spectacular, low-speed multiple roll into the gravel, bringing out the Safety Car before the cars were three quarters of the way round the opening lap. F1 drivers are supposed to have a “Super License” which is earned after they have proved their worth in lower formulae. This has obviously not been the case with this Japanese driver. Honda used their influence to get him a start. The FIA should use their influence and get rid of him. The rest of the Imola race was uninspiring. Well, from what we could see of it. The Italian TV director could only see a red car with a Fiat badge on it, so that’s what we got. I believe there were other cars in the race, but the glimpses were so short, you had really no idea what was happening further down the field. At one stage Brundle was calling for the director to show us something else, but gave up when he remembered the director only spoke Italian, as well as only recognizing Italian machinery. Another version of the new(ish) 3 Series has come to light, but a little earlier than planned, following the publication of leaked images on a US website last week. 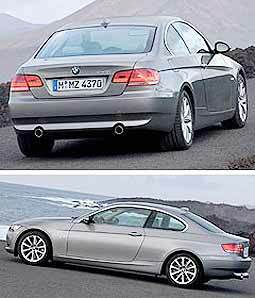 In a virtual repeat of the fiasco that saw the E90 3 Series sedan revealed via a leaked official brochure in August 2004, the two-door version of the same model, called the E 92, was officially revealed over the weekend after breaking cover many months ahead of its official debut at September’s Paris motor show. The top of the line is a new 225kW/400Nm 335i variant powered by the new twin-turbocharged 3 liter inline six revealed a few weeks ago in this column. Apart from being more heavily differentiated from its donor sedan than ever, both inside and out, BMW says the E 92 will bring new levels of driving dynamics - thanks in part to the all-new turbo six. Claimed to be the world’s first twin-turbocharged straight six as well as the first direct-injection engine to power a BMW road car, the new all-aluminium engine is claimed to significantly increase torque and acceleration without increasing fuel consumption. BMW claims 0-100 km/h acceleration of 5.5 seconds – 0.6 seconds better than the new R6-engined 330i coupe and 1.1 seconds better than the current 330i sedan – along with average fuel consumption of just 9.5L/100 km. This new 335i 225 kW coupe is moving closer to the current six cylinder M5, but the next generation M5 is expected to discard its 252kW inline six for a lightweight M5/M6 V10-derived 4 liter V8 that produces around 300 kW. BMW says this powerful 3 liter inline six weighs 70 kg lighter than the 4 liter V8 (such as that in the 540i and 740i), and its two small turbochargers are claimed to offer more power and torque more instantaneously than a single, larger turbo. In other words, turbo lag should be a thing of the past, however, I doubt if it has been eliminated totally. According to GoAuto, while an all-new M3 is not expected to surface until late next year, BMW has confirmed that apart from the 335i, the global E92 range will comprise the 160 kW 325i Coupe, the 200 kW 330i Coupe and the 170 kW 330d turbo-diesel, which unfortunately will probably not come here, as BMW have steadfastly refused to bring their brilliant diesels to Thailand. The E 92s will have six-speed manual or automatic transmissions, the latter claimed to be 40 percent more responsive than before. The BMW release does not mention whether the SMG (sequential manual gearbox) will be available. The entry level 325i coupe is powered by the sedan’s magnesium-alloy 2.5 liter straight six with Valvetronic, delivering 160 kW and 250 Nm of torque. BMW claims zero to 100 km/h in 6.9 seconds, a 247 km/h top speed and best-in-class fuel consumption of 8.4 L/100 km. The 330i Coupe, covers the 0-100 km/h sprint in 6.1 seconds. The most distinctively styled 3 Series coupe ever features unique body panels, unique lighting (including standard bi-Xenon headlights across the E 92 range) and even unique wing mirrors. Compared to the E 90 sedan, it has a lower profile, wider wheel arches, new full-length upper and lower character lines and redefined Hoffmeister C-pillar kick. Inside, the instrument panel is dominated by horizontal lines and is angled towards the driver, while the side panel design flows through to the rear seatbacks and the centre console is echoed by a new storage compartment between the rear seats. BMW claims the spring-strut front and five-arm multi-link rear suspension systems are the most sophisticated in the E 92’s class, while extra floor reinforcement and specific spring/damper tuning extracts the most from the new coupe’s 50/50 weight distribution and rear-drive layout. Since I would imagine these vehicles will also come with ‘run-flat’ tyres, hopefully the ride will not be as compromised as it is with the current 330 sedan. Latest-generation DSC stability control and a lighter, more rigid bodyshell are claimed to further raise the new model’s dynamic ability, while a new seatbelt feeder system, similar to that found in Mercedes’ CLK models, will be offered. Joining the E92 coupe, the E 93 cabriolet will complete the current 3 Series range when it debuts at the Detroit show in January 2007 – complete with a folding metal roof for the first time. Last week I asked which driver lost his left hand in 1965 and returned racing in 1966 using a hook? Hint – he had 111 victories and was an American. It was Mel Kenyon, who lost his hand in a racing accident. The International Motorsports Hall of Fame has this to say about Kenyon: “One of the greatest midget car drivers in history, Mel Kenyon started his career in modified stocks in 1955, then switched to midgets two years later. His first title was NASCAR’s Florida midget series in 1962, but he switched to USAC in the middle of ’62 and wound up 5th in that series. Kenyon was second in 1963, then won the first of his USAC titles in 1964. Kenyon had gotten a Champ car ride in ’65, but his career was seriously threatened by a wreck and fire in June. Kenyon returned to racing the next year, despite losing part of his left hand. 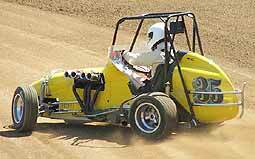 He finished second in midgets, and also fought his way to 5th place in his first Indy 500. Kenyon won 17 of 49 features to claim the midget crown in 1967, then placed 3rd at Indy and won the Midget title again in 1968. His career included 111 victories and seven USAC Midget championships.” I saw Mel Kenyon racing in Midgets on a trip to Australia and he was a winner there too. Extremely polished and smooth. So to this week. The Model T Ford is usually thought of as the first mass-produced vehicle, but this is not strictly correct as many other manufacturers also did this (Leland, De Dion Bouton and Lanchester). Henry Ford is also credited as being the designer of the Model T, but this is not strictly correct either! Who did design the Model T?